New England tour. Hiking, biking, and cards with Mom and Dad. Then a quick visit with Marissa and Annie's new kiddo. 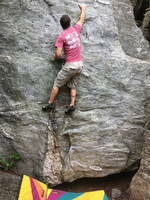 Climbing with Zupes at Farley. 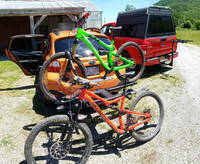 Off to Pittsfield where Zupes and I rode the Green Mountain Trails and the Rochester trail. After that we went to Kingdom and rode all day long. Rain the next day meant we got to rest! I drove to Burlington, met up with Carolyn, and we had dinner with Anna. 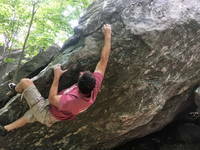 The next day we went climbing at Bolton (Hush, Mamma Thrush and Harvest Moon) and watched movies. My final day of the trip was with Anna and Mel. We went bouldering at Smuggler's Notch (Primate, Biscuit, Pac-Man, Skirt Roof) and swimming in a creek on the way back to Williston.